If you’re looking for a diverse mountain biking adventure in Southern Africa where your food, lodging and transportation details are all taken care of in advance and your only task each day is to get on your bicycle and enjoy a challenging mountain bike ride in a new and incredibly scenic location, then look no further, because the African Bikers Table Mountain to Addo Elephant Park mountain bike tour may just be the cycling experience you’ve been looking for. After several long flights I arrived in warm and sunny Cape Town, South Africa. It took nearly an hour for my bags to spill out onto the conveyor belt at the airport, but I grabbed them up just as soon as they arrived and carried them out into the arrivals area where I saw a friendly, sun-tanned man holding a white and orange “African Bikers” sign. I approached Steve and introduced myself. He happily informed me that I was the first of our group to arrive and that I should go and get some food in the airport’s dining area while we waited for the other tour participants to get their belongings and gather nearby. A short while later I was introduced to Harry and Kirsten (from Merzig, Germany) and Sandra and Erwin (from Hamburg, Germany). Introductions were made in German and I did my best to keep up with the group, but it was obvious (to both myself and everyone there) that my German skills were lacking. Steve (who is fluent in both English and German) was happy to translate our first few conversations together, but I later learned that almost everyone in our group could speak at least a little English. Now together for the very first time, Steve, Harry, Kirsten, Erwin and Sandra and I walked our belongings out to the curb where our driver, Anthony (we called him “Kim”), was waiting for us. Our gear was then loaded into a white passenger van pulling a small trailer behind it and we were driven from the airport to two different locations in the city where the final two participants of our 14-day bicycle tour across South Africa were picked up. We made a quick stop at the guesthouse where we would be staying in Cape Town, changed our clothes and then jumped back in the van. Kim then drove us up to the cable car, where we purchased round-trip tickets to the top of Table Mountain – the famous flat mountain that hovers above the city of Cape Town, South Africa. The views from the top were incredible. In one direction you could see all of Cape Town. In the other direction you could see nothing but green plants and blue ocean. After an hour or so on Table Mountain, we rode the cable car back down to our waiting vehicle. We were then dropped off once again at our guesthouse in the center of Cape Town and told that we had just a short amount of time to shower, rest and get ready before dinner. A short while later we were picked up at the guesthouse and driven across town to a local restaurant, where we ate together for the very first time, shared stories and wondered what our first day of mountain biking in South Africa might be like. What Is The Average Day On Tour Like? While no two days of the African Bikers Table Mountain To Addo Elephant Park mountain bike tour were exactly the same, our routine each day was relatively similar. We’d wake up early, eat breakfast at our guesthouse (usually between 7:30 and 8:30 AM) and then jump in our van and drive to some nearby mountain biking destination, where we would then unload the bikes and prepare for a good, long ride. After 2-3 hours of cycling, we’d stop and eat lunch (most of the time at a restaurant, but on occasion carrying a packed lunch with us or being provided with lunch at some roadside location). Then we’d conduct another mountain bike ride in the afternoon (or go to some nearby tourist destination) before calling it a day. Now thoroughly worn out and deserving of a hot shower and a good meal, we’d drive to a new guesthouse somewhere along South Africa’s Garden Route, shower, rest and then eat dinner at a local restaurant (often times within walking distance of where we were staying… and sometimes at the guest house itself). Then we’d go to bed early and wake up the following day and do it all over again. As you will see by reading the daily tour accounts above, there were a few exceptions to this daily routine (For example: our rest day half-way through the tour, our half-day at the African Penguin colony, and our safari adventure in Addo National Elephant Park). First of all, the diversity of the tour is incredible. While the routine each day may have been pretty much the same, the cycling experiences we had over the course of the 14-day tour was remarkably diverse. Each and every mountain bike ride was different from the others. One day we’d be cycling up steep forest roads and the next day we’d be darting over small hills in the desert. Then the next day we’d be riding narrow single-track trails in a jungle-like environment and the following day we’d be cycling through the sand on the shores of a wind-swept beach. Before participating in this bicycle tour, I would have never guessed that South Africa had so many different types of mountain biking terrain. The tour is incredibly well-designed in this regards. African Bikers has gone out of their way to not only find some of the country’s most beautiful mountain biking locations, but it has created a tour where every day is a new adventure in a new location with its own unique challenges and rewards. The diversity of the bike rides on this 14-day mountain bike tour across South Africa is by the far the best thing about the tour itself. The second-best moment from the tour was our 2-hour safari drive through Addo National Elepahant Park on day thirteen. While we did no cycling on this particular day, the fact that we got to see zebras, springbok, warthogs and more than twenty different elephants roaming around in the wild, was definitely a highlight. I’ve seen elephants in zoos before, but never (before this moment on tour with African Bikers) had I seen elephants walking around in their natural habitat. Not only did we get to see an elephant in the wild, but we saw nearly two dozen elephants walk within just a few meters of us. It was truly incredible… and one of my all-time travel highlights (not just in South Africa, but anywhere in the world). Finally, while I am tempted to mention our bike ride along the beach or a couple of the specific guesthouses we stayed at as a highlight of the tour (because we stayed in some truly remarkable locations), I feel the need to mention the company itself – African Bikers. There is so much research and planning that goes into a long-distance bicycle tour like this… and there are countless opportunities for something to go wrong. But this tour went really, really well from a management and logistical standpoint. Steve, our tour leader, was fantastic. He’s not only a skilled cyclist, but an excellent navigator, a true people-person, and a logistical pro. Doreen, who runs the main African Bikers office, was a joy to work with (and was always willing to answer my questions or go above and beyond the call of duty). And Kim (our driver) was friendly, fun, and skilled at his task of delivering us from one location to the next in a safe and timely manner. I not only felt at home with the people in charge of the tour, but I felt confident in their abilities. I had no fears about the tour falling apart any point along the way. I could tell (even after a short amount of time) that the management behind African Bikers has really done their job. The company has created an incredible mountain biking experience with this tour. They deliver their service with great passion and efficiency, and they should be commended for the tour that they’ve created. While I participated in just one of African Bikers’ many available tours, I have no doubt that the others tours on offer by the company are as equally well-produced. How Difficult Is The Cycling? If I had anything negative to say about my experience with African Bikers, it would have to do with the speed at which the riding on the tour was conducted. While I am an experienced cyclist (with thousands of miles under my belt in dozens of different countries all around the world), I am not a super experienced mountain biker. I knew that the mountain biking might be a challenge for me when I signed up for this tour, but in the end, it wasn’t the technical skills that ended up tiring me out the most – it was the speed. I was the youngest person on this bike tour, with some of the other participants being several decades older than me, but I was usually the slowest person in our group. Our bikes rides each day were at a really quick pace (a pace that I was not used to), and I struggled at times to keep up. While I was struggling to keep up with Steve (our leader), Harry and Kirsten wanted to go even faster than the majority of our group. This is one of the difficult things any time you get a group of people together for a bike ride. Each person has a different goal. Some people want to ride fast and be the first person to cross the finish line. Others want to ride slow, stop and take pictures along the way, and generally enjoy the ride. And others just want to make it from the start to the finish without stopping the entire way. Keeping everyone happy with the pace of our riding was a challenge we faced throughout the tour, but after just one or two days our small group of nine had developed a strategy that seemed to work for us. Harry and Kirsten would ride in front of the rest of us (using Steve’s directions to correctly navigate the course), while the rest of us would follow behind. Sometimes I would dash to the front of our group (usually to take a photo) and then I’d be left behind (and have to struggle back into position in order to catch up). Based on the speed of this tour (and the technical riding skills that are required), I would have to say that this particular mountain bike tour is not for beginners. The tour is designed for the moderate to some-what serious cyclist. I’d rate the difficulty of the tour as an 8 out of 10 (with 0 being the easiest and 10 being the most difficult). The rides each day are on average about 25 miles in length (40 kilometers) and require about 3,000 feet of climbing (915 meters). Technically, the riding isn’t all that hard (although there are plenty of single-track trails covered in rocks, tree roots, road debris and more, that could trip you up). Instead, it’s the speed (and the lack of stops throughout the day) that I think some people might struggle with. I know I sure did! Before committing to this particular tour, you need to have a fair amount of mountain biking experience. You should be able to ride up steep hills for long amounts of time, tackle downhills at relatively high speed, bunny-top over small rocks and tree branches, and generally navigate your way while keeping a steady pace. For more information on the speed of the tour and the skills you need as a cyclist in order to participate, be sure to contact African Bikers directly. They can probably explain the skill-sets needed for the tour better than I can. Why Participate In A Guided Bike Tour In South Africa? There are a number of reasons people participate in guided bicycle tours (the fact that some one else does all the planning, the cost savings (when you consider renting a car and driving to all these places by yourself), the opportunity to make new friends, etc. ), but personal safety is a big issue in a place like South Africa… and it is another good reason for conducting a tour with a company like African Bikers. The main advantage to traveling with a group is that you become less of a target that way (compared to if you were to travel alone) and the personal safety of each person in the group is easier to manage. African Bikers goes above and beyond to make sure you have a safe time in South Africa, by putting you up at wonderful guest houses, guiding you along safe mountain biking roads and trails, and even delivering you directly to the airport at the end of your tour. When you travel with African Bikers in South Africa, there really is nothing to be afraid of. Should You Bring Your Own Bicycle Or Not? When you sign up for the African Bikers‘ Table Mountain to Addo Elephant Park mountain bike tour, you have the option of bringing your own full-suspension mountain bike to use on the tour, or letting the company provide you with a bike. No matter which choice you make, you will need a full-suspension mountain bike, as the roads and trails on this tour are bumpy! For my particular tour, about half of the people participating chose to bring their own bicycles, while the other half had African Bikers provide them with a bike. If you choose to be provided with a bike for the tour, there is an additional cost, but the bike you get is a quality one. African Bikers provided me with a 29″ Giant Anthem full-suspension mountain bike for the tour, while the others riding company bikes chose to ride 26″ vehicles of the same name. The bikes fit well and perform excellently on the types of roads and trails you will be traveling on during this particular mountain bike tour. If you are unfamiliar with the term “guest house,” you will be familiar with the term by the time your tour of South Africa comes to an end. A guest house is essentially a bed and breakfast style property that rents out rooms (and sometimes small villas) to individual travelers. Sometimes the guest houses we stayed in looked like regular city houses, with the only difference being that the place was run more like a hotel than a regular family home. Other times, the guest houses we stayed in were situated on massive estates, where large rooms and sometimes small villas were handed out to each of us as our place of shelter for the evening. The diversity of the guest houses on tour was nearly as diverse as the mountain bike rides themselves. Some of the guest houses were top-notch, super high-class properties with welcoming, well-kept staff on hand who were available to cater to our every need. Other times, the guest houses were much smaller and felt more like staying in a typical bed and breakfast (or maybe visiting with a distance family member or friend in their home). A few of the guest houses were quirky and strange, with African-inspired architecture or hosts that looked as though they may have not showered in quite some time. The best guest house we stayed in may have been the Berg en Zee guesthouse in Gordon’s Bay, South Africa, which had large rooms, each with a beautiful view overlooking the ocean… or the remote Rooiberg Lodge, which was far from civilization, but had free wi-fi, beautiful villas, and a refreshing pool. The worst guest house was easily the Honeywood Lodge, which I actually liked because of its location in the mountains and the quaint little houses it had situated throughout its property, but disliked because of the dark brown (Coca-Cola colored) water it had coming out of its pipes (in the sinks, showers and toilets). Overall, I’d rate the guest houses on the tour as an 8 out of 10 (with 0 being the very worst and 10 being the very best). Unlike so many other guided bicycle tours where ALL the food (or at least most of the food) is included, this particular tour with African Bikers provides its tour participants only with breakfast each day (which usually consists of fruit, yogurt, granola, bread, coffee, tea and an optional egg, bacon or french toast combination) and a few lunches and dinners scattered throughout the tour. Most meals are eaten at restaurants along the way… and each person is expected to pay their own bill for the food that they order. This means that in addition to the cost of the tour itself, you need to budget in some extra money for food. Luckily, the food in South Africa is not super expensive (even when eating at nice restaurants). I was able to keep my restaurant tabs between 90-140 Rand for each meal (about $10.00 – $15.00 USD). Those drinking wine, ordering starters, and/or partaking in desert, however, sometimes ran up a tab that was much higher than this (maybe between 250 and 400 Rand). Besides the extra cost of the food, African Bikers has done an incredible job (once again) with selecting truly incredible dinning locations. As a vegetarian, I never went hungry, and I know that my meat-eating companions on the tour enjoyed their meals as well. Some of the included meals (when we stayed at the Rooiberg Lodge for three nights, for example, all the meals were included), I felt that the portion sizes were simply too small based on the amount of cycling I had done that day and the calories my body needed to replenish. But overall, the food on tour was really, really good! 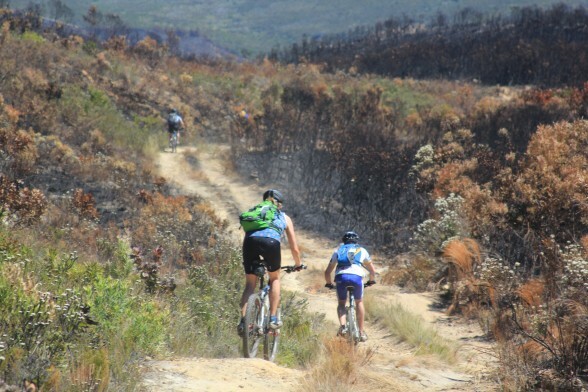 Would I Recommend The African Bikers Garden Route Mountain Bike Tour? The African Bikers mountain bike tour from Table Mountain to Addo Elephant Park was an incredible bicycle touring experience. I met some amazing people, cycled across a diverse network of roads and trails all across South Africa, ate delicious food, slept in wonderful accommodations, saw a number of wild animals, and even became a better mountain biker! I would whole-heartily recommend African Bikers as a company and I would say that if you ever get the chance to participate in one of their cycling adventures (whether it be this particular tour or any of the others that they offer), I recommend you do it! You simply won’t regret your time in South Africa! Sign up for a bicycle tour right now… or learn more about African Bikers at www.africanbikers.com. The photos below are displayed in no particular order. They do, however, demonstrate just how incredibly diverse this bicycle tour is in regards to the type of roads/trails being ridden on, the scenery, accommodations, food and more. Enjoy! Learn more about the African Bikers Table Mountain to Addo Elephant Park mountain bike tour at www.africanbikers.com. This entry was posted in Africa, Bicycle Touring Pro Articles, Featured Articles, Locations, Main Articles, Product & Service Reviews, South Africa, Videos and tagged addo elephant park, africa bike tours, african bikers, african bikers cycling tours, african bikers testimonials, african bikers tour review, african bikers tours, garden route bike tours, south africa bike tours, south africa cycling adventures, south africa garden route tours. Thank you. What a great report. I could almost feel the fun. Great photos. Another item on the bucket list. Excellent report on a very well run tour. Photography was/is first rate. Many thanks to you for bringing this to those of us who may never get there. Thanks for the great report Darren. It was a pleasure to have had you on board and show you the diversity South Africa has to offer. We look forward to seeing you or your readers on tour in the not so distant future. You mentioned you disliked the coca-cola coloured water at Honeywood Lodge – that is actually very clean mountain water and safe to drink in the mountains. The water is soft, with generally low PH, and has a brown colour due to dissolved humic acids from decaying plant matter. Thank you Darren for yet another wonderful description of one of your tours. I loved the photos (the ‘posy’ of elephants is gorgeous!). 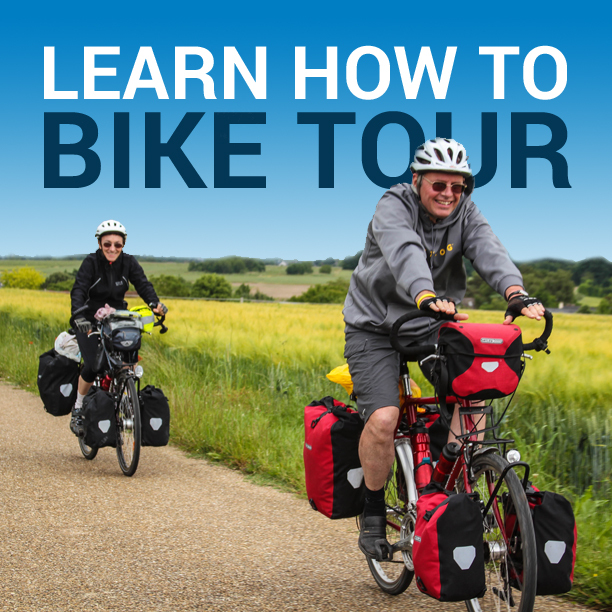 My cycling adventures are much more humdrum but great fun and I’m doing more and more – your resources & website have really helped me get going with touring. actually amasing & atractive! I enjoyed & admired you & your cycle group. I”d love to be with you & hope you to be succesful to developing such a lovely sport in all over the world! thanks a lot. I am enrich with this report. Stunning write up of the tour. We actually met Steve in Namibia on our way back from cycling Malawi Lake to Mossel Bay. With a guy like that the tour can only be a success. I am really really glad that you have such positive things to say about our neck of the woods. We actually wanted to meet you in Mossel Bay when you were here but we weren’t sure which day. Think it was raining at the time as well. Thank you Darren the write up.